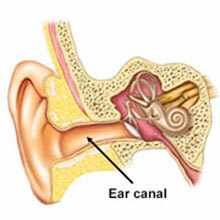 Swimmer’s ear or otitis externa is an infection of the skin which lines the ear canal. This is common in swimmers and can be either a bacterial or a fungal infection. Symptoms include earache, redness, itching and possible discharge from the ear. There may be excess wax and possible hearing loss. Pain is produced when pulling down on the earlobe. Swimmers ear is commonly found in those who swim regularly. Water trapped in the ear causes the bacteria usually found there to multiply as it creates an ideal, warm, moist environment. Swimming in unclean water increases the risk of getting the condition. Other things can cause the condition, including damage to the ear canal for example cuts or damage from cotton buds etc, chemicals such as hairspray getting into the ears and skin conditions such as eczema. Early treatment of otitis externa is advised to get the best results and to avoid any further damage. Treatment usually involves gently cleaning the ear and ear drops containing a mild acidic substance to kill the bacteria. Antibiotics may be prescribed by a Doctor for more severe cases. Antibiotic drops are usually used although oral antibiotics may also be prescribed if the infection has started to spread. Checkups will be required to ensure that treatment has been successful. Use plugs when swimming to keep the ears dry. Dry thoroughly after swimming and showering with a hair dryer or clean, dry towel. Do not use cotton buds and avoid chemical substances around the area. Use earplugs or cotton wool balls to stop chemicals from entering.